Stitches West 2010 was my first time around visiting one of these events. It was a sensory overload at all levels. I found very strange that they did not allow Photographs, who would have thought that The British Museum was behind the times by allowing photography and such a small event did not. I was disappointed at some levels and at some levels I was not. They had plenty of clean restrooms, the food was ok. Coffee was fantastic, but I brought my lunch and water, because it was a place where once I left I would go home. It took two hours by public transportation from San Francisco. The event was so much veered toward knitting, spinning , looms, but not much for crocheting, sadly that is the way of the industry. The only way crocheters are gong to have a say is by participating and by making their presence known. Yarn was greatly displayed, lol. 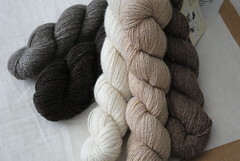 All kinds of yarns from discounted to discontinued. 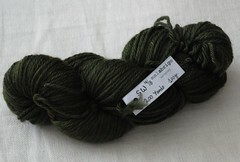 There were a lot of beautiful yarns and colorways, but I stayed within my limits. It was hard to restrain myself from purchasing without end. There was a some low quality yarn there as well, but you know what is not good for me is good for others. 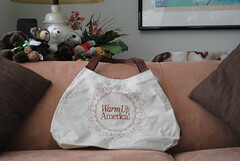 I was able to get a vendor pass by participating in the Warm Up America Booth. I say they did not plan this well, they could have sold hundreds of thiee bags, but they were gone by the time Friday Noon came around. at $ 10.00 is a great bag to carry projects around and big enough. 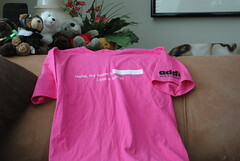 I finally got my T-Shirt from our friends at Skacel, this was for purchases at some time in the past. I was able to talk to the owner of Skacel, Karin Skacel and had a good laugh. I shared with her the fact that our Men Who Knit Retreat Boxer's KAL was going on and we will be having a fashion show. This Pattern by Skacel's Brian Kohler is very cute, I just don't like the Trekking Yarn. I went to visit more of my friends and Toot's Le Blanc was one of them , I got my fiber fix from them and gave them a second hat that they can use for my patterns. I was lucky to get to meet Antonio González-Arnao, the founder of Malabrigo and that landed me a skein of superwash worsted skein , gratis for testing.I guess that my biggest purchase were my Signature DPN Needle, not for the timid and for the seriously foolish dpn enthusiast. a set of five is worth about $ 55.00, but if you give me the choice between wood and this, I rather have metal. These are made in the USA, so We have no lead in them. It is an investment and maybe a bit of a luxury, but we shall see how it works. I have seen their straight needles, but those are not really my forte. 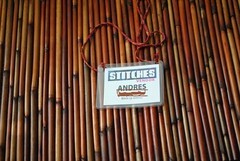 Stitches West was an interesting venue, but not something I have to have. I enjoy my time and looking around, but definitely is a one day thing. The class rooms were around the vendors in spaces created for people. I was not really impressed, but I will tell you that is a nice place to visit at least once during the weekend. This is definitely the place to look for new patterns, new gadgets and new colorways. All in all I did not regret going two days in a row. Will I go next year? You bet, I don't want to be misinformed about my yarns lol. Thanks for stopping by!